Beta-carotene is one of a group of red, orange, and yellow pigments called carotenoids. Beta-carotene and other carotenoids provide approximately 50% of the vitamin A needed in the American diet. Beta-carotene can be found in fruits, vegetables, and whole grains. Reduce the risk of sunburn. Some people who sunburn easily, including those with an inherited disease called erythropoietic protoporphyria (EPP), use beta-carotene to reduce the risk of sunburn. Beta-carotene is used to decrease asthma symptoms caused by exercise; to prevent certain cancers, heart disease, cataracts, and age related macular degeneration (AMD); and to treat AIDS, alcoholism, Alzheimer’s disease, depression, epilepsy, headache, heartburn, high blood pressure, infertility, Parkinson’s disease, rheumatoid arthritis, schizophrenia, and skin disorders including psoriasis and vitiligo. It is recommended to get beta-carotene and other antioxidants from food instead of supplements, at least until research finds out whether supplements offer the same benefits. Eating 5 servings of fruits and vegetables daily provides 6-8 mg of beta-carotene. 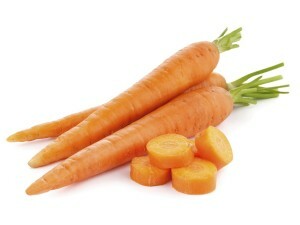 Carrots are one of the richest sources of Beta-carotent. Your body turns beta-carotene into vitamin A, so its beta-carotene content is illustrated by the fact that one small carrot supplies nearly 300 percent of your daily recommended intake of vitamin A. So, like mom always said… it’s essential to eat all of your carrots.